Yeah, that’s supposed to be the way into the living room. Don’t come over to visit yet. But, there is good news. During moving weekend, despite the rain and my sore arms, I was lucky enough to acquire a few key pieces of furniture that are perfect for the house. (Me = happy dance). Not exactly free… but exactly what I wanted! Then, later that day, I inherited these amazing bamboo & wicker chairs from my friend Lindsay who is headed to Florida for grad school. Although I’m sad to see her go (really, I am – she’s a great friend), I am honored and excited to have these chairs on my front porch. Especially because A) she got them for free, and spray-painted the seats herself (they used to be dark green), and B) they look great around the random kitchen table that I got from a neighbor three years ago, and couldn’t fit anywhere in the house except the front porch. Oh yes. I am pleased. Come see me soon (but not too soon) and enjoy all the fun new places I have for you to sit! 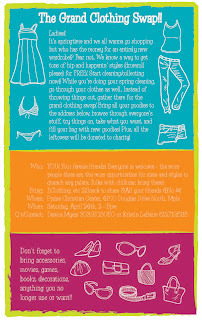 My amazingly creative friend Danica and her friends are hosting another clothing swap. We’ve apparently outgrown their house, so this time the swappage will take place at their church in Minneapolis. Come and join us if a) you’re a girl (sorry, guys) and b) if you like cleaning out your closet and getting lots of fun stuff in return. Last time I went to one of Danica’s swaps, I not only came home with a bunch of great clothes, but also a black bag that turned out to be perfect for my trip to Thailand. Saved me a pretty penny at Target, let me tell you. 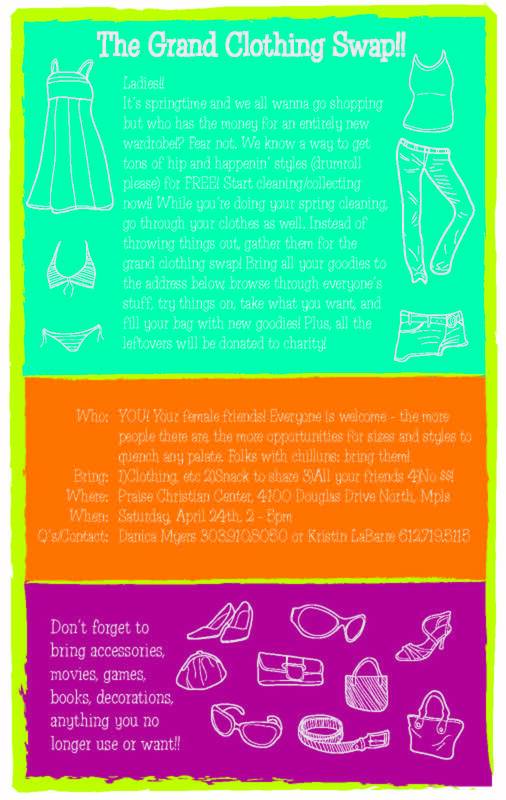 Bring: Clothing (and accessories, movies, games, books and household items) to swap, a snack to share, all your friends and no money! Check out Free Finds out if you’re interested in learning more about how I find free furniture, tools and other fun things. I’ll also post photos of my latest discoveries and, occasionally, links to free events or product giveaways that I think are particularly awesome. The Room by Room page is pretty self-explanatory… photos of the house, room by room. The “before” photos are from the inspection and closing day. I’ll post “after” photos for each room as I move in and decorate over the next few months. Another thing: I’ve made some changes to the back-end of the blog this weekend, so if you subscribe to the RSS feed, you might want to unsubscribe and resubscribe to make sure you’re seeing everything. Let me know if you have questions. I’ve been sick this weekend, so I didn’t paint the second coat of red in the kitchen. But I gave away a pile of stuff on Freecycle! And started packing boxes… so it was still productive.